The imposing building on Mount Road, Chennai, was specifically designed to protect its stock of books. THE Rs 3,400-crore Indian book industry is going places. Book stores, it appears, are the flavour of the season. In the last three months, three book store groups have been snapped up. The latest is the Rs 61-crore all-cash buyout of Chennai-centred book retailer Odyssey by Hyderabad-based newspaper publisher Deccan Chronicle Holdings Ltd. Then again, after picking up 51 in the India Book House-promoted Crossword, Shoppers’ Stop group of Bombay bought out the balance 49 per cent holding in July. Another deal was the acquisition of Landmark, by the Tata-run Trent. But all three book stores involved in these deals are relatively newcomers on the book retailing scene in India,especially in the South. The mantle of the oldest book store in the country belongs to Higginbothams book shop, in Madras. In fact, if its adjacent books godown standing on a plinth of more than two acres is taken into consideration, this 10,000 sq ft bookshop can be called the largest bookshop in India. Higginbothams came into existence in 1844. 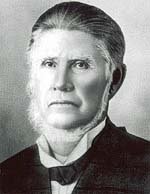 In those days, there was a great influx of Christian missionaries, especially Protestant evangelists to India and one Abel Joshua Higginbotham got the task of managing the Wesleyan Book Shop at Madras. It is alleged that Higginbotham was a British stowaway, who was pushed out in Madras port by the irate captain of the ship. But our stowaway was an educated person, who had a phenomenal memory, when it came to books. He relished the job in the Wesleyan Book Depot. It so happened that the missionaries found the book shop a losing venture and our friend was able to buy it for a cheap amount. He then set up his book shop "Higginbothams" on Mount Road. In the initial days, he could not afford an assistant or cashier and used to take the customers to the book shelves himself, trusting that nobody would raid the Till, that was left unguarded. He soon attracted the attention of the ‘book worms’ in Madras, who found that Higginbothams would order for them any book they wanted, from the four corners of the world. The visit of the Prince of Wales ( future King Edward VII) to Madras in 1875, highlighted the importance this shop had in the Empire. "Higginbothams & Co" stated a contemporary account, " has the unsolicited honour of being appointed booksellers to His Royal Highness, as a mark of favour not conferred on any other firm of booksellers in India". The former stowaway was made the Sheriff of Madras in 1888 and 1889. 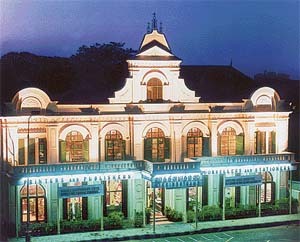 After his death in 1891, the business passed into the hands of his son, C. H. Higginbotham, who presided over the bookshop’s move into its present premises on Mount Road to mark its diamond jubilee year in 1904.To quote a local historian "The building was designed specifically to protect its precious stock: the high ceiling allowed the air to circulate in order to reduce mustiness, potentially destructive to books; the number of windows was kept to the bare minimum to protect books from the dust of the unmetalled roads and were decorated with stained glass imported from Europe. Italian marble floors and a splendid staircase leading to a second floor added to the building’s ornamentation." Allied activities such as publishing and printing were pursued in succeeding years and by 1929 Higginbothams employed as many as 400 people. In this period, the valued list of the shop’s customers included eminent persons like Clement Attlee ( on an official visit to India as a British MP, later the Prime Minister), the veteran Indian statesman Rajaji, who became the first Indian Governor General in 1948 after the British left; and Sir S.Radhakrishnan, the second President of India. The third phase started in 1945, when Higginbothams was bought over by the Amalgamated group headed by Indian industrialist C.A.Anantharaman. 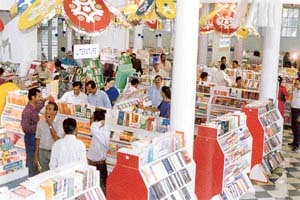 The showroom was the largest book store in India till the 1990s. The 1990’s were also a period of a great land rush in Madras, as real estate agents, wrecked down many landmarks in Mount Road, including the venerable 19th century fa`E7ade of Spencers to provide multi-storey buildings.. But the owners of Higginbothams feel, that it is their duty to ensure that the heritage of Madras as represented by their century old building should be kept alive and so far have not agreed to its demolition, for a giant skyscraper building, that would rake in billions of rupees.